You are currently browsing the category archive for the ‘Mainstream fiction’ category. 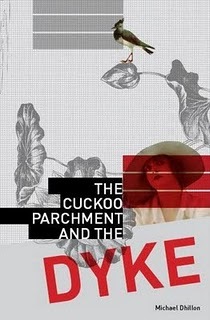 Michael Dhillon’s self-published The Cuckoo Parchment and the Dyke is a well-written, but flawed book. Tristan Jarry is the most famous artist in the world but a recluse who has been rarely sighted in public. Angelique Burr, the estranged stepdaughter of the US President, is gifted the task of doing Tristan’s first interview in over a decade. However the offer of the interview is soon revealed to be Angelique’s elaborate kidnapping, staged by Tristan. The narrative swaps between accounts of Tristan’s early years (his escape from a death camp; his early years studying art living under a brutal totalitarian regime) to Angelique’s kidnapping in the present. While keeping one step ahead of authorities, Tristan and his accomplices stage performance art pieces around the world, it seems specifically for Angelique, until Tristan reveals the most elaborately planned piece of performance art ever devised. Inspired by the Dada non-art non-movement, Tristan intends to start a revolution to free the world’s imagination.